Ok, by now you might have realised I like dolphins, so here are a few links, and a little relevant information. This is something that is probably isn't elsewhere on the net. There are three main areas where people can meet dolphins within Western Australia : Underwater World, Bunbury and Monkey Mia. Times have changed. UnderWater World has undergone two fairly radical changes. The first of these was non-volentary and unwanted. 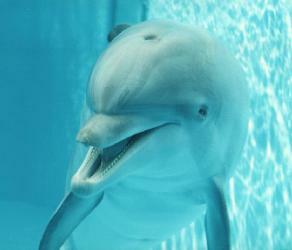 In late December 1999 all of UnderWater World's dolphins died. Originally it was believed Milah died from a heart attack and the remaining two dolphins died shortly afterwards from stress and possible heat exaustion. However, when these two factors were ruled out, followed by water pollution. The autopsy results came back, the official cause of death given as heart attacks induced by poisoning. The police were called in, a criminal investigation began. The most widely accepted theory is the dolphins were slipped fish laced with an unspecified poison. After six months of investigations the case was marked unsolved. A lack of evidence was cited. No suspects were ever named. The departure of the dolphins marked a turning point for UnderWater World. It changed its name to Aqwa (Aquarium of Western Australia). It has developed a seal enclosure (Seal Island) which has various seals from the Eastern States which failed their rehabilitation. The dolphin enclosure remains, but is empty. Aqwa as said they would not be after any more dolphins unless the safety of them could be guarenteed, with the very design of the enclosure, this is very difficult, so the likelyhood of dolphins returning to Aqwa is unlikely. Underwater world is an oceanarium/aquarium located at Hillarys Boat Harbour, about 45min north of Perth. It never really meant to have dolphins. Its main drawcard is a huge aquarium with a perspex tunnel running through the bottom of it. Its very spectacular and well worth a visit. Underwater world has also become somewhat of a rehabilitation centre for marine creatures - usually seals, sea lions and turtles. Underwater World use to have three dolphins from a closed oceanarium called Atlantis, north of Perth. Atlantis closed in 1990 and most of the dolphins were rehabilitated and re-released. It took two years with varying degrees of success. One died, two are going fine, three are outside tracking range but believed to be ok and the remaining three (Rajah, Milah and Echo) did not do too well. They were continuously begging fish from boats and they were losing condition. It was decided to re-capture them. From 1992 to 1999 the three dolphins were housed in a large sea pen at Underwater World. The dolphins, being dolphins, produced two offspring, from Milah and (most likely) Rajah. Kila drowned when her rostrum got caught in the pen's netting. In 1998 Indianna was born, she died in the spring of 1999 from a massive bacterial infection. Then, between Christmas and New Year's Day the other three adult dolphins died. It now has no dolphins, nor active plans to repopulate. Bunbury has Koombana Bay where the Dolphin Discovery Center is located. The web pages below would be the best places to go for information. Briefly - wild dolphins come into the beach over 240 days throughout the year. There are four regulars - Uey, Flap, Sharky and Thinfin. Since they are online and have a very good web page, that is all I'll say, but I will answer questions if you have any. Monkey Mia is probably be one of the most famous places involving dolphins and man. The dolphins come in to shore on a daily basis - usually two or three times per day. Up to 18 dolphins come into shore and CALM (Government department for Conservation and Land Management) has a strong presence there to ensure the dolphins are not harassed. Also keep a lookout for Percy the Pelican - he has a tendency to steal fish from you. As luck would have it Monkey Mia is in the middle of no-were. About 700km north of Perth at Shark Bay, however it is a really interesting area, but a little out of reach for a day trip ;-). Monkey Mia Dolphin Resort, a very nice place on the beach at Monkey Mia, about 30m from where the 'phins come in. Live web cam of the beach. If its crowded, then the dolphins are in. Mandurah, located about an hour south of Perth, also has dolphins. Its ironic that it would be the closest place to me, yet I've never been there. I will do it one day, then I can put in more info about it. Western Australia has lots of coast line. Way over 5000km of it. Dolphins can be found over all of it. In the south west of the state, from Esperence to Perth, organised whale watching run during the whale season. If you time it right, there is a good chance of watching the whales frolic in the shallows near the shore. Pods of dolphins are common all along the coast. Even the Swan River, that runs through the CBD has a local pod of dolphins in it. I've outlined some of the main and well know interaction places above, however that is not the be all and end of all of. (Although, if you wanted to see dolphins, they would be your best bet). A lot of the dive operators offer swim with dolphin trips. One thing to be aware of though, all the dolphins in Western Australia are wild. You might turn up, but there is no guarentee that the dolphins will be there. Here I've provided some more links to local operators. This is no way an endorsement, rather it is a service. Rockingham Dolphins offer a swim with the dolphins programs. If you know of any other services I should add, drop me an email and I'll add them in. Last modified: July 15 2006 07:52:05.